WARNING: Never modify the basic hierarchy structure of an IO. Only the interactions list and the visuals can be modified at will. A list of all the interactions of this IO. 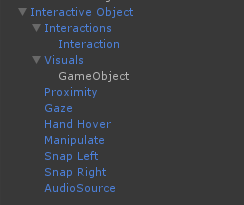 You can add as many interactions as needed for each Interactive Object. List of user’s assets defining the visual aspect of this IO. You can also leave this empty (keep the Visuals node and remove anything inside it) to use this IO as a trigger zone like a checkpoint, an invisible button, etc. When you convert an asset into an IO, the asset itself is automatically placed in the Visuals child part of the IO. Zone around the IO where collisions can occur. Zone around the IO that reacts to the gaze of the user (camera forward direction). 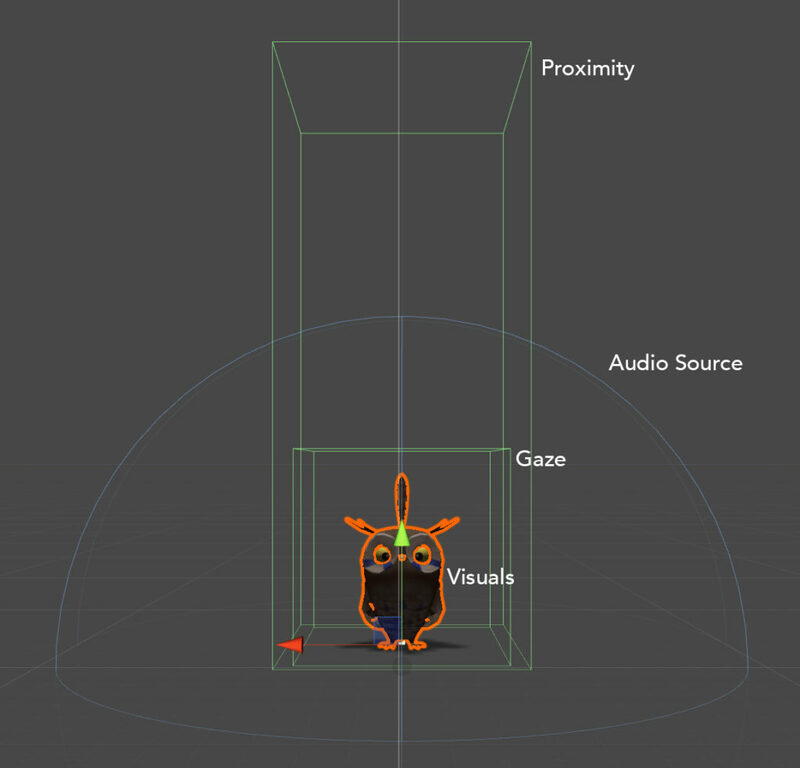 This zone defines where the IO will react to hovering with hands ray cast. This zone defines where the IO can be taken with Grab ability. This transform object defines the position and rotation the IO will translate into when grabbed by the left hand. 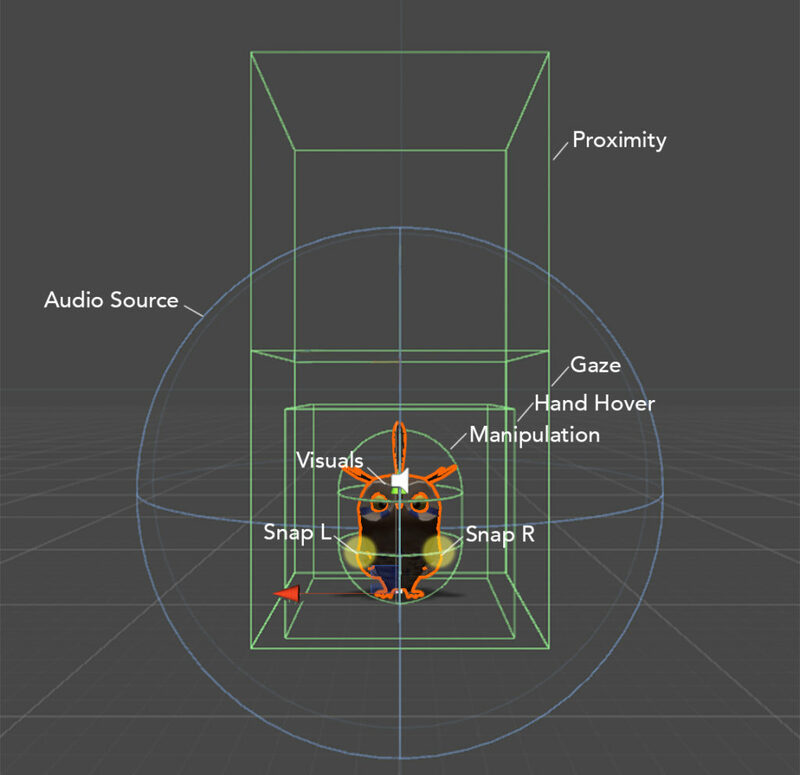 This transform object defines the position and rotation the IO will translate into when grabbed by the right hand. This object will play the audio clips defined by your actions automatically at runtime (do not put any clip inside). What you can do is associate an Audio Mixer. Visuals can be anything 2D, 3D,… Note that you will have to create groups of IOs if you want to place several of them at the same time. 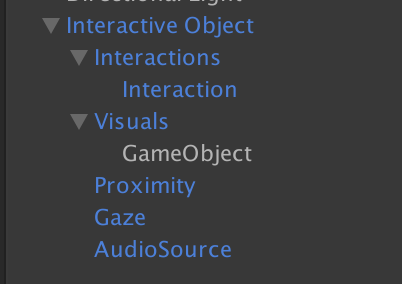 Meaning that you will have a main interactive object with other IOs inside its visuals. Take a look at Placing Objects in AR. For simplifying goals, the Gaze zone is here also used for the Touch condition.